UPDATE: Aram Dol now functions normally. He now switches to melee, and drops more loot. Go ahead and download and get the updated version. This mod makes the Shrine of Spirituality dangerous. Only install if you're into tough challenges. It is a very powerful axe from Serpent Isle. at the shrine of spirituality. if they are to retrieve this treasure. can set the encounters for the duration of the game. Does it conflict with other mods? Liche are already pretty powerful in Lazarus. But this custom version is far more dangerous. Move velocity is much faster. The spells it cast are extreme. A low level Avatar will have terrible time at it. you should be strong enough to face it. Use all the strategy you can. 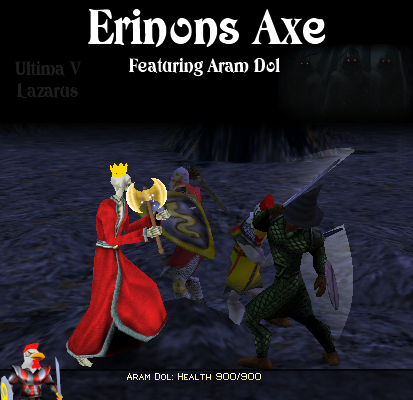 Updated the Mod (Erinons Axe). Aram Dol now switches to melee, forgot to add the job file to the mind. And he drops more loot now. Go ahead and download the new version.